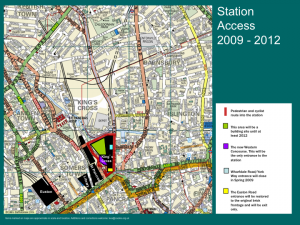 The notorious King’s Cross gyratory including junctions on the A501 ring road – Euston Rd/Gray’s Inn Rd/ Pancras Rd/York Way – has had more than its fair share of cyclist injury and fatality. Time to stop this, if Google built GooglebridgeKX, a safe route for pedestrians and cyclists completing the link from The Angel to Marylebone it would make a massive difference. Meanwhile, here’s the petition calling on the Mayor to take action. Hint to Google – how about teaming up with Transport for London to design a fab safe bridge from York Way to King’s Boulevard? There has always been an east/west walking route from Wharfdale Road, across York Way to what was Battlebridge Road and beyond. 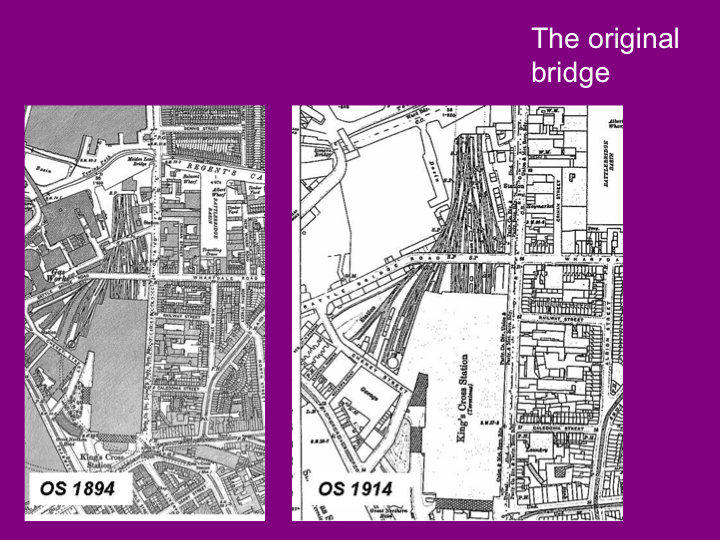 Once King’s Cross Station was built the original road bridge, which was part of Battlebridge Road, crossed the tracks over the platforms joining York Way where a small number of buildings now sits at the Wharfdale Road entrance. The remains of the cobbled street here can still be seen. This bridge was lost to the area sometime between 1914 and 1922. Figure 1. Battlebridge Road in 1874. The foundations for the bridge are very unlikely to have been removed, making a replacement bridge a relatively simple engineering task. 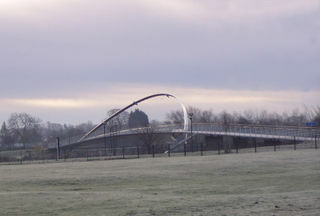 The community campaign is calling for a pedestrian and cycle bridge (referred to below as a footbridge) following exactly the route of the original road bridge and with no access, gated or otherwise, onto platforms. 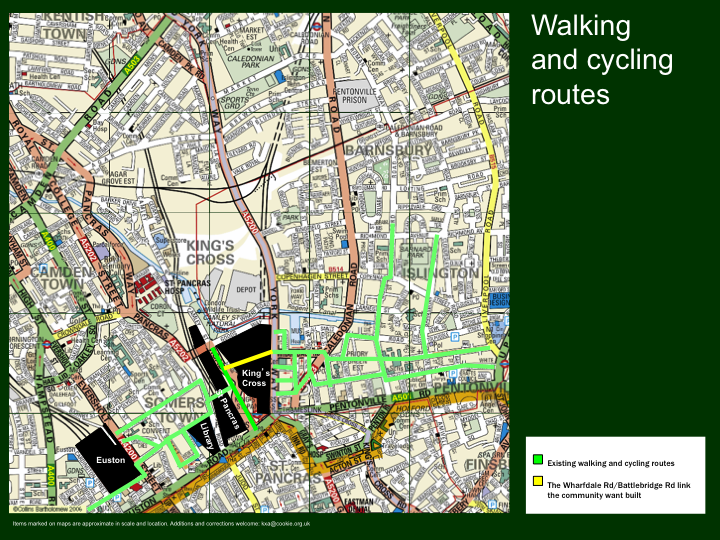 This route would take pedestrians and cyclists close to and from the entrances to King’s Cross and St Pancras, a choice of tube station entrances (lessening congestion at the Euston Road tube entrance) and would provide the remainder of the east west walking and cycling route that could exist from the Angel all the way to Marylebone Station avoiding Pentonville, Euston and Marylebone Roads. 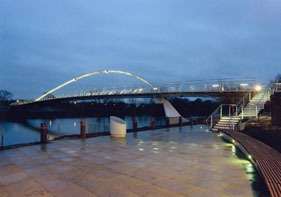 The community has called this bridge “Battlebridge Crossing”. Figure 2. Impression of Battlebridge Crossing. 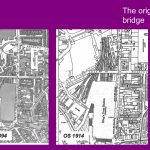 Since 1922 the east west route was served by the Wharfdale Road entrance and the internal Handyside Bridge. In February 2008 LB Camden gave planning permission for the current redevelopment of King’s Cross Station on condition that a feasibility study would be carried out into provision of a footbridge across the rear of the tracks to replace the Wharfdale Road/York Way entrance which will be lost as a consequence of constructing a new Platform Y. At this point Network Rail estimated that 3,400 people use the Wharfdale Road/York Way entrance each day. This figure will have increased substantially following the opening of King’s Place, home to the London Sinfonietta, Orchestra of the Age of Enlightenment, Pangolin Gallery and The Guardian/Observer. It will further increase in line with current estimates for population growth in the area. 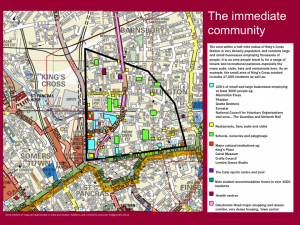 During the February meeting councillors stated they required the study to be as wide ranging as possible and to consult with the local community. 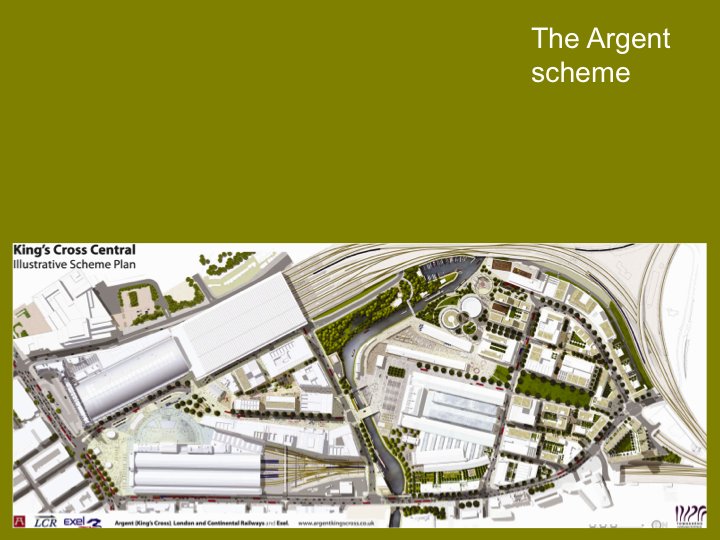 Network Rail appointed Arup to carry out the study. 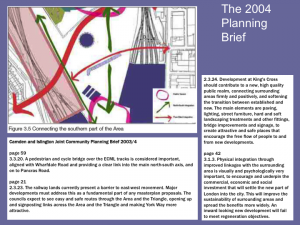 Unfortunately the study was limited to bridges that included gated entrances onto some or all platforms and did not include any community consultation. LB Camden appointed Colin Buchanan, a well known transport and urban design consultancy, to assess whether the Arup study fulfilled its requirements. Despite many concerns about the specification and content of the study being raised by various groups, Buchanan’s concluded that the Arup study did comply with the Camden condition. As a result of Buchanan’s finding Network Rail was then obliged to release £1 million to LB Camden for environmental improvements to York Way. The local community has always made clear that no matter what improvements are made to either York Way or Goodsway – much needed though they are, structural and immovable elements of the streetscape result in these routes being inappropriate for heavy pedestrian or cycle use. Such elements include the canyon effect including the sheer amount of traffic on the York Way side of the King’s Cross Gyratory, the bus depot on York Way, the camber on Goodsway, the taxi priority for the transport hub, the building site effect of King’s Cross Central likely to be present for at least the next twenty years, and the walking/cycling journey times to and from the transport hub. Meanwhile a bewildering number of studies is taking place into movement and open spaces in King’s Cross. These will add to the very large body of evidence already existing from the number of such studies undertaken over many years. A notable such study is the ‘Walkability Audit’ carried out for TfL by Living Streets. Another new study has been announced by LB Islington. This will assess the business case for Battlebridge Crossing. 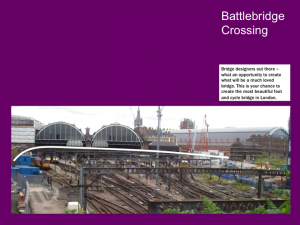 The community campaign for Battlebridge Crossing has concentrated on finding a means of getting Network Rail to accept that they should fund and build the bridge as a matter of some urgency. Network Rail are benefiting from construction of Platform Y which will increase revenue. 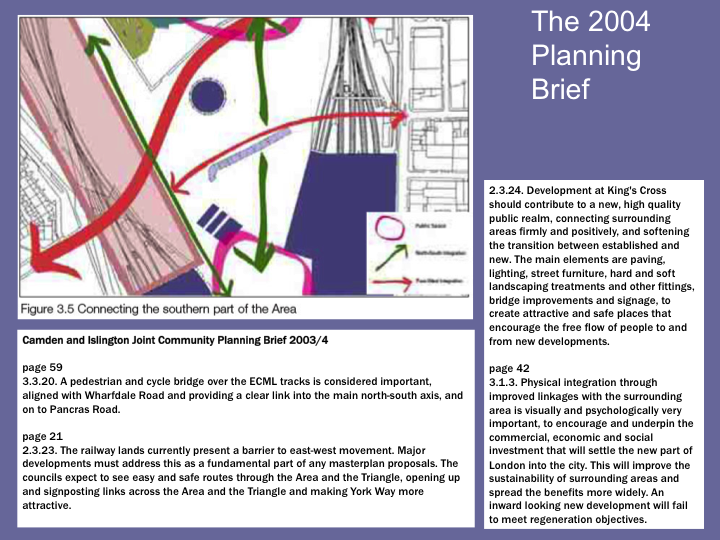 This benefit arises from removal of public amenities: the Wharfdale Road entrance and Handyside internal footbridge. The community’s case is therefore that Network Rail should replace these amenities. The urgency for construction of the footbridge results from the closure of the Handyside Bridge which has already been achieved and closure of the Wharfdale Road entrance which will be achieved once the scaffolding on the eastern range of the Station is removed. At this point the last vestiges of an east/west route will be removed and it is at this point that it should be replaced. 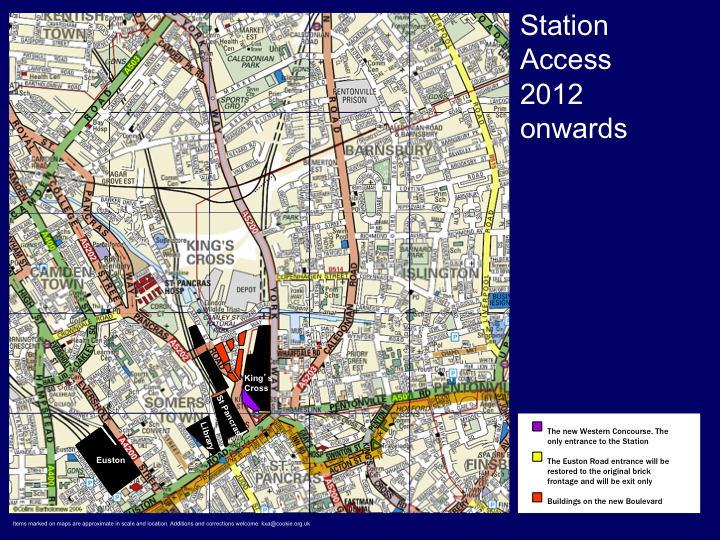 This urgency is further required as Argent King’s Cross is currently under a S106 obligation to house the western end of the bridge on its land. This obligation ceases in 2012. 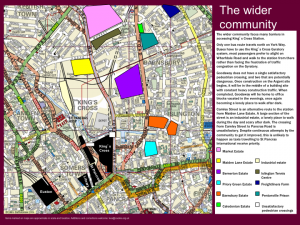 The community campaign has cross-party support and includes businesses based locally such as Gratte Brothers, P&O Estates, Regent’s Quarter Ltd and a major international publisher as well as councillors from Camden and Islington, TfL who have committed to do all in their power to ensure Network Rail builds the bridge, LB Islington via the West Area Committee, the chair of the Greater London Assembly – Jennette Arnold (Lab), deputy chair of the Transport Committee – Caroline Pidgeon (LD) and various AMs, Islington Chamber of Commerce, Islington Conservative Association, Emily Thornberry MP, the Liberal Democrat prospective parliamentary candidates for Islington South and Finsbury and Holborn and St Pancras, Norman Baker MP LibDem Shadow Transport Secretary, the Campaign for Better Transport (previously Transport 2000), Living Streets and approaching 1,000 signatories to a local petition. Network Rail estimates the cost of Battlebridge Crossing to be £4.5 million. This represents approximately 1% of their station redevelopment budget and is a tiny amount compared to their contingency fund for that redevelopment. The community campaign has identified a number of recently completed bridges along with their costings in order to identify the scale of project and type of bridge that might be achieved. Figure 3. Bridge crossing the River Ouse at York. Cost £4.3 million. The community is keen that the bridge should be a gateway encouraging greater footfall to and from areas that need such urban regeneration including Somers Town and the south end of the Caledonian Road. As such it should be a destination of itself in the manner of the Millennium footbridge over the Thames at Bankside encouraging further visitors to these areas. Figure 4. Sail Bridge in Swansea. Cost £2.8 million. York Millenium Bridge. 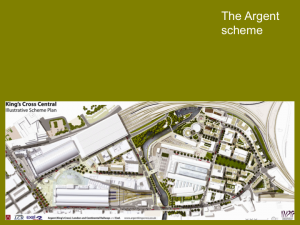 This one we could definately afford – less than 1% of Network Rail’s redevelopment budget for King’s Cross Station – a tiny bit of their contingency fund – only £4.3 million. Bridge dreams – a cut out and keep series no 5!!! 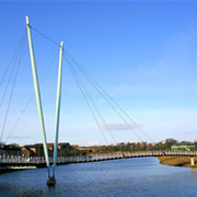 Award winning pedestrian and cycle bridge, the Millenium Bridge over the River Lune in Lancaster, more views. Total cost? What a bargain, just £1.8 million (we could have two of these!!!). Bridge Dreams – a cut out and keep series no 4! 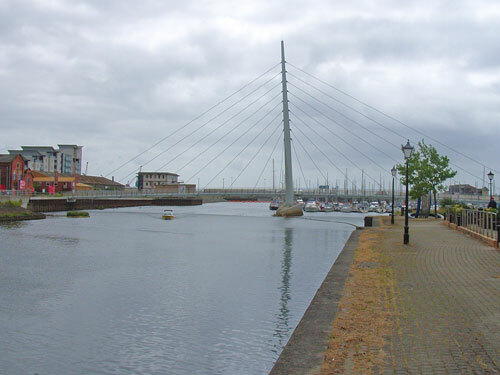 Sail Bridge, a beautiful bridge in Swansea. Total cost? Just a snip at £2.8 million.